Affiliated Individual and Associate members of the NFMA enjoy the same member benefits as members of Constituent Societies. Benefits include discounts on registration at Annual Conferences and Advanced Seminars, ability to attend Constituent Society meetings, access to the Online Membership Directory, the Members Only Job Bank, and Meeting Handouts. Above and beyond tangible benefits, is the knowledge that you belong to the organization that serves as the voice of municipal analysts with regulators and other industry groups. You are invited to participate on committees and projects that make a difference in the municipal bond industry. As a member of the NFMA, you will be able to network with other municipal analysts across the country. If you do not live in proximity to a Constituent Society, you can apply for membership in NFMA as an Affiliated Individual. Both Regular Members of Constituent Societies and Affiliated Individuals are Regular Members of the NFMA. 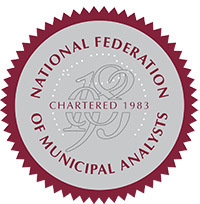 In order to be accepted as an Affiliated Member of the NFMA, we request that you spend at least 25% of your job time in municipal research, legal analysis, portfolio management, or supervision of these employees. Other types of municipal finance professionals can be admitted to NFMA as Regular Members on a case-by-case basis and at the discretion of the NFMA's Membership Committee. The NFMA currently has Affiliated Individual members in Arizona, Colorado, Kansas, Maryland, Maine, Michigan, Missouri, New Jersey, New Mexico, Ohio, Oregon, Pennsylvania, Virginia, Washington and Wisconsin. If your job duties do not enable you to apply for Regular Membership in the NFMA and/or its Constituent Societies, you can apply for Associate Membership in the NFMA. Associate Members shall be defined as professionals in the municipal industry or related disciplines who do not meet the requirements for membership as Regular Members. Associate Members may not serve as an officer of the Federation, nor may they serve on the Board of Governors, or vote on amendments to the constitution.